I am happy to be joining in on Jo's Easter Treasure Hunt Blog Hop this year. 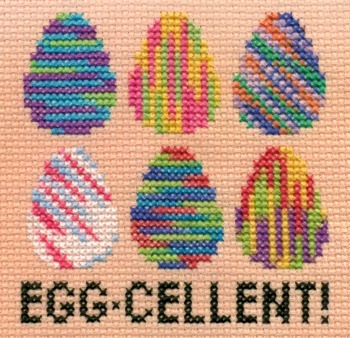 I hope you are having an EGG-cellent time hopping around the blogs and enjoying the beautiful stitching! Happy Spring! Happy Easter! Happy Stitching! Happy Easter. I love the brightly coloured eggs. Both your designs are lovely! I hope you have a very Happy Easter! 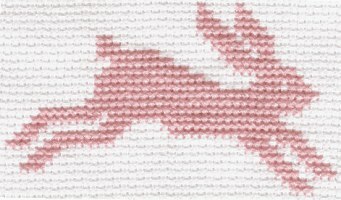 Beautiful Easter and Spring stitching - so cute. Happy Easter. Stopping over with a Happy Easter and a follow. Thanks for taking part. Two for the price of one here! Love your brightly coloured eggs. I love the bright colored eggs and the hopping bunny. Have a Happy Easter. Love the bunny and the eggs. I landed here from Jo's blog hop, and I love your quilled eggs! Fantastic. Such tie dye eggs and my niece would be over the moon if I stitchd those for her. Can you tell me what the pattern is? Actually I just "free stitched" the eggs without a pattern. I used a variegated floss called "Tie Dye". I stitched in full X's and worked in different directions for each egg (horizontal, vertical, and diagonal) to create the color patterns. Hope the info helps! Thank you all for the nice comments! I hope you enjoyed the blog hop & had a Happy Easter! What great Easter designs you chose to share with us, Cheryl! The eggs are adorable! Pretty eggs.Stopping by from Jo's Easter blog hop. I started to ask where did you get the pattern then read your response to another commenter. What a great idea!